Let's face it. We have our good days and our bad days. Things happen that affect our moods. It used to drive me nuts when someone would say, "Think positive," or "Keep your chin up," as I faced challenging times. Nothing like the obvious to irritate you. I knew that thinking positively would help me, but I wanted to know how to get there when I felt anything but positive. When my friend and spiritual mentor Merv told me to practice gratitude, no matter the situation, my eyes and heart opened, and things began to change for the better. Something shifted inside. I began to feel lighter in my being. Giving gratitude for what you have is a great success technique when you need to raise your level of vibration from the depths. Well, why should I give thanks? one may ask. Well, why not? You'll actually do more harm than good by staying at a lower vibration. Giving gratitude is a spiritual practice that will elevate your mood. As you voice (or think) your thanks, you emit positive energy out into the Universe. The Universe responds in kind by giving you more of those things for which you are grateful because it is a law by which the Universe abides. It wants to give. Another way to help you raise your vibration is to use the Emotional Guidance Scale* which charts 22 of our emotions. The lower one goes on the scale, the unhappier that person is. The higher, the happier. One doesn't have to work through each one to get higher on the scale. Ask yourself where you are emotionally on this scale. Then through positive self-talk, move yourself up. Give gratitude for moving up. Do things that make you feel happy. Before you know, things have shifted and you find yourself moving right along. You feel better. Let's say you are feeling angry because someone you love said something derogatory to you. Not only did it anger you, but it made you feel insecure and unworthy. What you are feeling has tripled and now you are carrying a very heavy load of emotional baggage. And you are telling yourself, "That jerk. How could he say that to me? Am I really that way? Maybe I am! I feel so terrible about myself. I'm worthless. He's right." Now you've really piled it on! How do you even begin to change this? Acknowledge how you feel. Admit your pain. Then give thanks for moving up the scale. Begin thinking about things that make you feel happy. Think about all the kind words that others have said about you. And hold on to those thoughts. Your self-talk may be something like, "He has know idea who I am. What he said is merely his perception, not mine. People have always commented on what a good person I am. They have told me how kind I am. I AM a kind person! I AM a good person! No one can stop me from being me!" Suddenly all that emotional baggage is gone. You've shifted and moved up the emotional scale. As you hold on to those positive thoughts, you automatically let go of the old, negative ones because you can't hold both a positive and a negative thought at the same time. You may vacillate between the two, but the more energy you give to the positive, the better you feel, and the higher you go on the emotional scale. 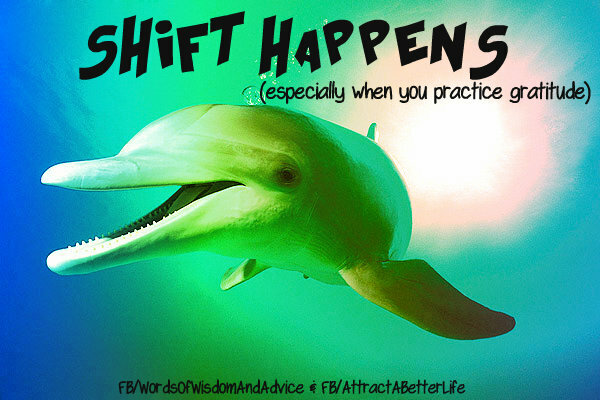 When shift happens, give gratitude! *Emotional Guidance Scale as used in Ask And It Is Given by Esther and Jerry Hicks, pg. 114.